Many years ago, I went on a walk with Dave Tucker to Fryingpan Hills and just over 10 years ago went to Mount Charles via Midsky Swamp. When viewed from Gumtop Ridge the cliffs at the edge of the hills look most spectacular and this was the attraction in going there on this walk. 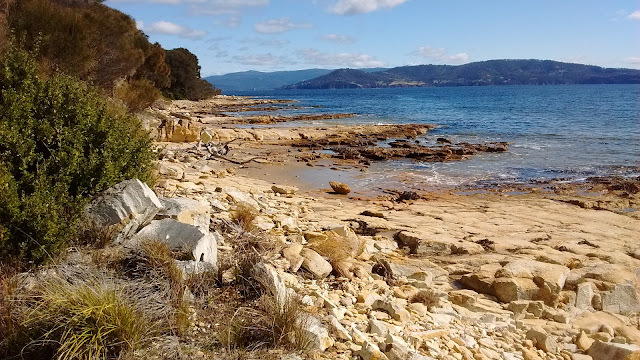 Initially is was uphill along a 4wd track, followed by a dip to a creek and a climb back up to finish at the clifftop. The last 200 metres was through bush after leaving the track and soon dryer vegetation was reached on the sloping land taking us down to the cliff edge. An easy way was found ending in a severe drop at the clifftop. It was quite advantageous as it was one of better spots for views and, with the sun out made it enticing to stop for quite a while and take an early lunch. 19 September 2017 On arrival at the start spot for the walk we could not but notice the sign saying no entry, which caused some concern. The house opposite had smoke from the chimney, but no one was there. Next was to drive back to where we saw two people working at a farm, but that didn’t provide all that much helpful information. Tuesday 12 September 2017 This was supposed to be a walk to Fryingpan Hills, but the imminent arrival of showers persuaded us the eastern shore would be a more congenial area. Although Gunners Quoin was the destination, the route to get there was quite different from the usual way. Part way along the way we branched off and headed to the high hilltops and once there we were able to have the pleasure of walking over flat open woodland before arcing towards Gunners. By now we had picked up a rough vehicle track which wound through country with a dense low understory with masses of Epacris; unfortunately, not yet flowering apart from a few exceptions. After Gunners Quoin we ventured out to Madmans Hill, where the first drops of rain commenced. Down to Saggy Flats where more consistent, but nevertheless light, rain began falling. It had more of less stopped by the time we reached the car. During the last leg, we encountered a great many wallaby beside the track above the dam. Sunday 10 September 2017 A short walk along the Blessington Track, which has not been there long, at least in this upgraded form. At the end of gravelled track, Fort Beach was walked and this was quite soft and somewhat tedious to trudge, for the first third but then became firmer and the going much nicer. At the end of the beach, access is allowed to Cape Deliverance within military establishment of Fort Direction and this leads on to Pot Beach. After traversing some of the rocky platforms a difficult bit was reached but we went up onto the headland for some good views of the Iron Pot. Return was by the same route. Friday 1 September 2017 Quite a delightful day and reasonably calm, although it was cold in the breeze at the cape. Although we last walked there in 2007, the photos taken showed that we went over Mars Bluff. That is the reason why we could not remember going through the gap on the coastal route., as it is most spectacular and something not easy to forget.